Doreen Massey, who sadly died just over a week ago, was someone who inspired generations of geographers to see the world differently, and introduced many to ideas of space and place, and the way that the world ‘works’, underpinned by geographical ideas connected with power geometries and geopolitics. Reading Doreen’s work was an invitation to challenge your thinking and immerse yourself in her ideas. The first time I met Doreen was a few weeks prior to starting my role as Curriculum leader with the Geographical Association, back in 2008. I met David Lambert, and we drove to the Open University for a meeting with Doreen and colleagues: Clive Barnett and Joe Smith. Coming straight from the classroom to my new role it was exciting and challenging to be involved in discussions regarding forthcoming support for teachers. I didn't know at the time, but I would later be employed by the OU for 18 months to run their VITAL CPD portal through 2011-13. I also travelled down to the BBC to watch the recording of an episode of ‘Thinking Allowed’ on the subject of psychogeography, with Will Self, Doreen and Richard Sennett – I blogged about it here. Later that year, I attended an Interdependence Day seminar at Sheffield University, convened by Dr. Tariq Jazeel, and Doreen’s work had influenced the speakers, particularly her ‘World City’ book. 2008 was obviously a year of ‘immersion’ as in December I attended a lecture on spaces of optimism in a globalised world. At the GA Conference in 2010, I was excited to watch her keynote lecture, and was asked to write up my observations on the lecture for the GA website. They can be seen here. I was wearing a Google t-shirt with a location pin design and the words ‘I am here’ on the front and chatted with Doreen about where exactly ‘here’ was. 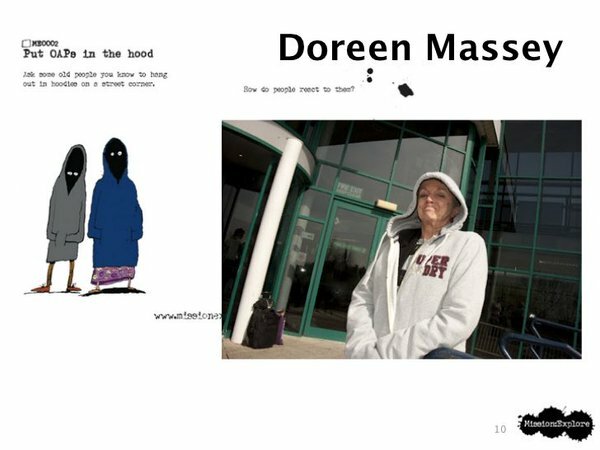 We introduced Doreen to our Mission:Explore books at the Derby conference, which were part of a major push to introduce them to people. Doreen was also happy to get involved in supporting us. She was happy to wear a hoodie and flick the ‘V’s at Bryan Ledgard as he took her photo. Hoodies also featured in one of Doreen’s articles. Doreen was Honorary Vice-President of the Geographical Association, and she was both critical and supportive of the work of the association. I received a number of e-mails from former GA colleagues last weekend sharing memories of her. There will undoubtedly be some celebrations of her work as part of the forthcoming GA conference. She will continue to influence future generations of geographers yet to be introduced to her work. Within hours of the announcement of her passing, there were many memories of her inspirational ideas from people across the world, who remembered particular pieces of writing, or meetings with Doreen, often an introduction to thinking differently.